On 10/5/12, I went to 1977. Actually, I went to Florida. But I went because of 1977. 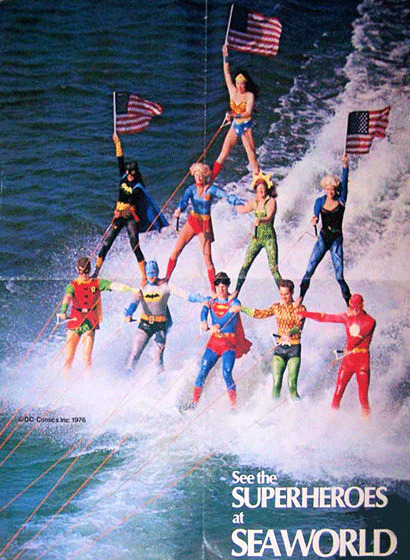 I went to meet people who, in 1977, were water skiers in the groundbreaking superhero show at Sea World in Orlando (and Ohio). And whom, in 2010 and 2011, I tracked down. After interviewing more than 40 of them, I posted an oral history of what some call the most accomplished water skiing show ever mounted. During the ski show, most of them were teenagers or in their early twenties. Their recollections were entertaining and often moving, frequently unique (how many people you know got paid to water ski?) yet familiar to anyone who has had a summer job or a summer crush. Many had not stayed in touch with anyone else from the show, and through my series, some found themselves reconnecting. It wasn’t a surprise to me when talk of a reunion surfaced. Thanks to the initiative and considerable efforts of former superheroine Betsy Maher and those she recruited, a reunion did indeed come into being, just over a year after the final entry in my series went live. The superhero show closed in 1979, making this the 33-year reunion…and making Betsy a superheroine still. As we all know, reunions are a lot of work to organize. But I developed friendships from afar with these people, and some of them encouraged me to get over my hang-ups and show up. I went down just for the night so I traveled light. That’s a genteel way of saying I didn’t bring a change of shirt or pants. Or an umbrella. Which is foreshadowing to this: it was pouring. So much for holding the cocktail kick-off outdoors, the most appropriate setting for such a reunion. My clothes got drenched in the mad dash from the parking lot to the Caribe Royale lobby; luckily, they dried before the party. The turnout was stellar; I would say no fewer than 150. I thoroughly enjoyed watching old friends bear hug, laugh heartily, go back in time. Many recognized me and came up to thank me for inspiring the reunion. I said they inspired me, so if anything, they inspired their own reunion. Randy Messer, one of the skiers who had been particularly forthcoming and generous, thoughtfully brought a copy of Bill the Boy Wonder: The Secret Co-Creator of Batman, so I signed a Batman book to Green Lantern (the character I most associate with Randy—and a character also first written by Bill Finger). Other skiers asked if I brought copies to sell (which I never would have done though I was flattered that they asked). 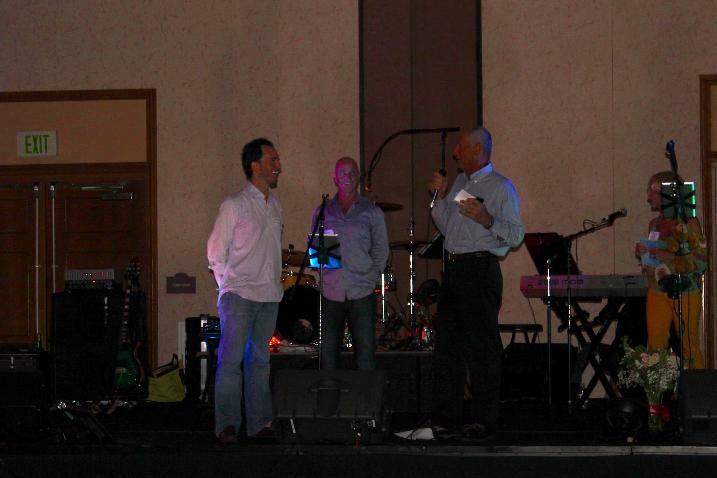 A highlight of the evening was when Tom Weber took to the stage to welcome everyone. He reminisced eloquently and then began a story from the summer. It was hard to hear but I did make out my name. At that point, someone gently shoved me onto the empty dance floor. Tom gestured for me to come on stage, which I did. While driving and listening to the radio, Tom continued, he caught an NPR story about Batman and a writer named Bill Finger. Tom quickly realized that the guy telling that story was the same guy who had bugged him the year prior to answer a bunch of questions about the Sea World superheroes show. 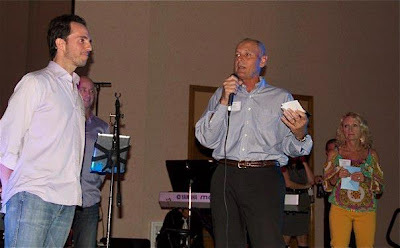 Tom expressed gratitude on behalf of the group for my inadvertent role in getting the old gang back together. I was, yet again, touched. I came observing bear hugs and I left receiving them. That’s a successful reunion. See everyone—and more—at the 34th? Posted 7:00 AM Labels pop culture nostalgia, Sea World, series: Super '70s and '80s, where are they now? It was nice to meet you, Marc...glad you were able to come to the reunion! This is great, Marc. Congratulations and thank you for bringing these folks back together and letting more people recognize their place in comic book history.